A Children's Toy Inspires A Low-Cost Medical Tool : Shots - Health News A paper version of a spinning children's toy can replace laboratory centrifuges to process blood tests. The "paperfuge" may help diagnose malaria and other diseases. Scientists have found the inspiration for a lifesaving tool in an unusual place — a children's toy. The invention may soon help health care workers diagnose malaria in places where standard laboratory equipment is hard to find. Diagnosing malaria in the field isn't all that difficult, but you need a device called a centrifuge that can spin a blood sample very quickly, causing different types of cells in blood to separate from each other. Most centrifuges are bulky, require electricity and are expensive. Because of that, many field hospitals in developing nations don't have easy access to the technology. The Paperfuge operates like a whirligig toy. Researcher Saad Bhamla pulls the strings to generate the effect of a medical laboratory's centrifuge. Manu Prakash, a professor of bioengineering at Stanford University who developed the new tool, saw the need firsthand during a trip to Uganda. "We were out in a primary health center talking to health care workers and we found a centrifuge used as a doorstop because there's no electricity." The workers said that they really needed a powerful centrifuge that they could use anywhere. And it needed to be cheap. When he got back to California, Prakash began experimenting with all kinds of things that spin, including toys. Toys might seem like a strange place to start, but Prakash didn't think so. Who doesn't love toys? And, he explains, "Toys hide in them pretty profound physical phenomena that we just take for granted." The researchers started to experiment with yo-yos. But the yo-yos didn't spin fast enough to work as a centrifuge. Then they stumbled upon the children's toy known as the whirligig, or buzzer. 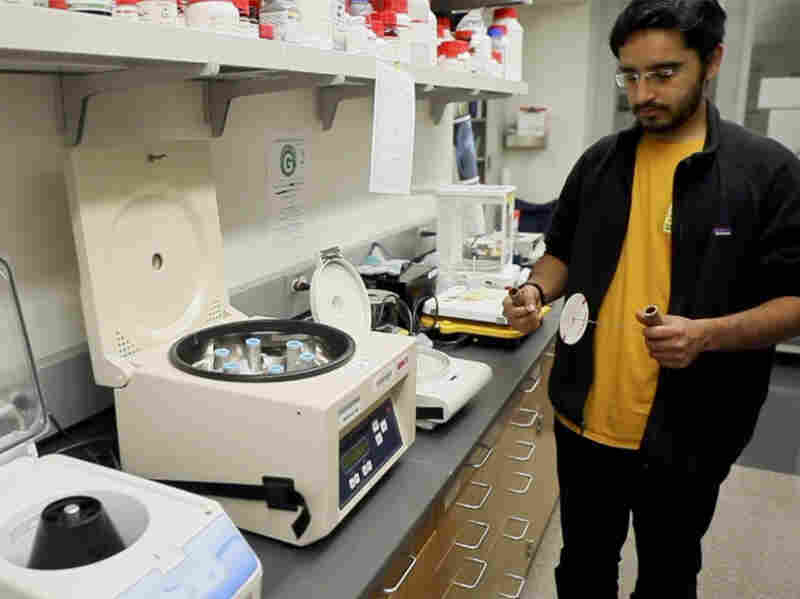 Saad Bhamla holds the paperfuge next to an electrical centrifuge. Both can separate blood samples. The toy is made of a disc that spins when a person pulls on strings that pass through the center. And it spins much faster than a yo-yo. The scientists clocked their version at 125,000 revolutions per minute. According to the authors, that's the fastest rotational speed reported for a human-powered device. By comparison, the internal combustion engine of a Formula One race car rotates at about 15,000 rpm. And so the paperfuge was born. The paperfuge is made out of paper coated in a polymer film that makes it extra strong, string and PVC pipe or wood. Blood samples are attached to the center disc and pulling the strings causes the cells to separate, just like in the more expensive electrical centrifuge. The samples can then be processed and tested for parasites. The paperfuge team works on the newest prototype. They include (from left) Saad Bhamla, Aanchal Johri, Chew Chai, Manu Prakash and Brandon Benson. To prove that the paperfuge could work in the field, the researches took a prototype to Madagascar for a test run. It worked as advertised, allowing local health care workers to spin blood and test for parasites. 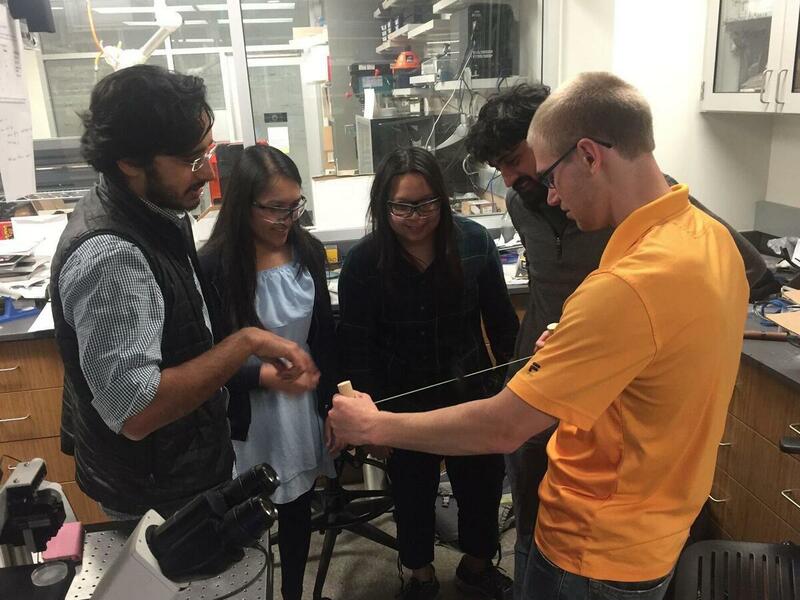 Prakash and his colleagues reported their results Tuesday in Nature Biomedical Engineering. This isn't the first time that Prakash has invented a low-cost tool for use in resource-poor areas. A few years ago, his group also invented a $1 paper microscope called the Foldscope. The paperfuge is inexpensive, costing just 20 cents apiece to make. They can be made by hand or by machine, and the spinning disc can be made of paper or plastic. Using a desktop 3-D printer, the study authors printed over 100 paperfuges in one day. That means if the paperfuge catches on, it could be relatively easy to make and distribute to resource-poor areas. Now that Prakash's group has shown that it's effective in identifying malaria, they are working on developing different variations of the paperfuge that could help diagnose other diseases.